Step out of the city life by going to Parc Merveilleux and Petrusse Casemates. Do some cultural sightseeing at Bourscheid Castle and The Family of Man. 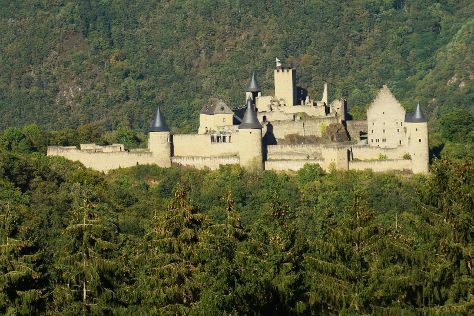 Venture out of the city with trips to Abbey of Echternach (in Echternach), Beaufort Castles (in Beaufort) and Larochette Castle (in Larochette). There's still lots to do: get engrossed in the history at Musee d'Histoire de la Ville, enjoy breathtaking views from Pfaffenthal Lift / Aufzug/ Scenic lift, let little ones run wild at Pirate Ship Playground, and explore the different monuments and memorials at Sandweiler German Military Cemetery, Luxembourg. For more things to do, other places to visit, where to stay, and tourist information, refer to the Luxembourg City online trip planner . If you are flying in from Iceland, the closest major airport is Luxembourg-Findel International Airport. In June, plan for daily highs up to 25°C, and evening lows to 14°C. Cap off your sightseeing on the 2nd (Mon) early enough to travel back home.